Things got very heady in the beer world a couple of years ago. Global market leader ABinBev acquired its rival SAB/Miller (then the No2 in the world) in a deal worth a staggering €79bn. While the acquisition created a giant that now sells one in every four beers worldwide, it has also produced an unexpected hangover. The shares have dropped by a half since their peak three years ago and the company is saddled with huge debts. Other international beer makers have been alerted to the dangers of saddling themselves with borrowings as well as taking too much for granted. Not least of these is the 155-year-old Dutch company we are examining today, Heineken. It may seem odd to think of Heineken as a minor player because it isn’t, unless of course it is being compared with ABinBev. It sells more than 300 brands, both international and local, in 190 countries and employs 80,000 people worldwide. In Ireland it is the owner of Murphy’s stout and other recognisable owned brands include Fosters, Tiger, Bulmers, Amstel, Strongbow and non-alcoholic Buckler. It is also heavily promoting another beer for those ‘on the dry’ called 00 and that itself may be a sign of the times. The Dutch brewer has a broad global footprint with a considerable revenues and profits coming from emerging markets. However, Europe – a mature market – is still its biggest revenue earner, with slightly less than half of all its sales but only one-third of its operating profits. The standout markets are Spain, Portugal, Italy and France, and while Heineken suffered a decline in sales in the UK it still owns the third largest pub chain, useful in any downturn. The Americas is Heineken’s second largest market and accounts for a quarter of the group’s operating profits. Its critical markets are Mexico and Brazil. Mexico is its largest market in the region. Heineken is now the second largest beer company in Brazil following its acquisition two years ago of Brasil Karin, one of the largest beer and soft drinks producers in that vast country. Performance in the US is patchy, business is flat with declines in parts of its portfolio and it faces the increase in competition from craft beers and consumers drinking less beer. Its Asia Pacific region is growing in importance for Heineken and while the company is experiencing growth in most Asian markets, China and Vietnam are the exceptions. For a company with a reputation for elbowing itself into key markets, it has failed miserably in China, which is a key market for global brewers. It has struggled to gain a foothold, failed to establish scale and its market share is a pitiful half of 1pc. In contrast, Carlsberg has 5pc and ABinBev 16pc. 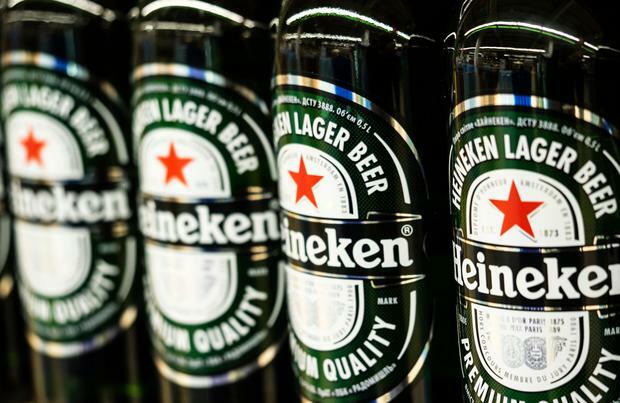 Heineken decided to step back from its standalone Chinese operation. In future it will collaborate with a local, powerful and politically connected Chinese brewer, CB Beer, a unit of the sprawling state-run conglomerate CBH. In a complex deal with China’s best-selling beer producer, Heineken, in exchange for a minority stake, will hand over its local operation and give a licence to CB to produce its premium priced beer. Heineken delivered strong results in spite of global instability, volatile currency and a profit warning mid-last year. Profits and growth rose, driven by the Asian and South American regions. Its revenue was €26.8bn, up one-third over the last seven years and net profits jumped 12pc to €2.4bn. The share price at €89.88 is 50pc above that of 2012. However, investors fret that the Dutch brewers’ emerging markets could be vulnerable to weaker global growth driving down its 9pc profit margin. This is not a concern that Heineken appears to share as its priority for capital expenditure is concentrated in emerging markets like Ethiopia, Mexico, Cambodia, Vietnam, Haiti and the Ivory Coast. Clearly the company sees its future beyond its European base and its shares are worth considering.